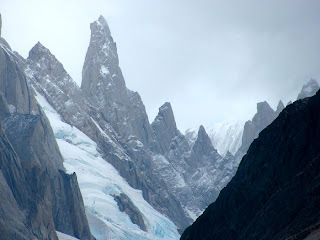 The impressive spire of the Cerro Torre is surrounded by an entourage of similarly shaped towers. The one in the picture above is called the Aguja Bifida, or Torre Bifida. It rises to an elevation of 2,400 meters. But it is dwarfed by the Cerro Torre which rises another 700 meters higher.